Pallavi Mahidhara playing Prokofiev 3rd Concerto. Shared on facebook by Rana Dasgupta. Listen to her play this wonderful piece. Talking of Khaled, the great Algerian singer, I first got to know him from his song, Didi. This is the song, Aicha by the Algerian rai singer, Khaled. I'm sharing both the Original version in Frensh as also a version with English lyrics. This is the original French one. And this is the one with English lyrics too. I am writing campus short stories in a satirical vein. Fictional, imaginative, creative short stories but I have got complaints, threats, and personal attacks have been mounted on me. I have also got praises. It gives me immense pleasure to tell you that I was featured as one of the 100 Professors You Should Follow and Learn from on Twitter. It was really sad that Sri Lankan cricketers were attacked and that they were injured and the attackers got away scot-free. It points to the fact that Pakistan has become a failed state and that there are a number of security problems with the country at large. Have you seen my Technorati Profile? It also includes information about my other blog, Issues in Academics, http://issuesinacademics.blogspot.com, which I think is doing very well. I have been reading in the newspapers that the Indian parliamentarians have debated whether they should enforce a code of ethics for the media (read, electronic media) in events of national importance and disaster. This debate is sure to open up a can of worms, however, keeping in mind, the rather problematic, if not abysmal, role played by the television channels in the recent coverage, this would be a welcome step. My last post was 10 days ago and in the last 10 days, a lot seems to have happened. The first and the foremost that is in our minds--the sad Mumbai terror attacks, some people have called it India's 9/11. Amitav Ghosh, the well known writer, has written a very interesting article on it. But we can always discuss that link later. What was very distressing to me was the fact that the Indian media people were very immature. We had live updates and the Tv channels had to be told by the security commandos that they should stop live updates because it might give away the positions of the forces to the militants. Isn't it shameful? Can't the TV channels have enough sense to understand such delicate situations? When the 9/11 took place in the US, did the US TV channels react the same way? Did they too show bloodied bodies on their networks? We had a number of channels and newspapers stating that 'the country was brought down to its knees' or 'the city was brought down to its knees' by 'ten' or 'twenty' young men etc. When 9/11 took place did Bush say so? Did US media say that the US was brought down to its knees? Or that the country was cowed down? These are very important and pertinent questions. Finally, Obama has decided to appoint the Treasury Secretary, which helped the US markets go up by 400-450 odd points. This is good news. Now, he should get the fiscal stimulus plan going as soon as possible. Finally, we have Barack Obama firmly ensconced in the White House but in the last two days, the Dow Jones has fallen a good 900 points. There are still fears about the economy and they refuse to go away. After electing Barack Obama and after ecstatic crowds in New York, which I saw on the channels, it is time for the economy. General Motors has fallen again. It keeps on making multi-year lows. The last low that it made for perhaps a 53 year low. So, is the company going to fold up? If that is the case, then the low prices of the company's stock could well nigh be justified. Else, it would simply be the case of oversold and over-afraid stock markets. There was a wonderful article that I read by Warren Buffett. It was published in the New York Times as an op-ed article and it was titled, "Buy American. I am." I found the title very interesting. It was a very insightful piece which made out a case for buying into the stock markets. I remember a very interesting line from that article. He said that we have an opportunity today to buy a slice of America at a marked-down price. I thought it was put pretty well. Yes, there is a lot of bad news on the financial front. We are in the midst of a global recession. This is pretty much clear to everyone. So what? We had the Great Depression in 1929 but by 1932, the stocks had gained by 30% and much later, they had gained phenomenally. So, didn't the Great Depression too go away within a life time? It did. Let us look at the bad news. There is bleak US job data. There are profit warnings from GM and Cisco. UK is in a recession. Some nations are close to defaults and need IMF protection. But the prices at which some well-known companies are available today both in the US and in other markets is mind boggling. The low stock prices make you feel as if these companies were going to fold up and close shop. But I don't think anything like this is going to happen in either the short or the long term. This is mere emotion. I would like to give you a very interesting fact. If you look at US markets, there is a company called Kraft Foods. They make cheese, biscuits and other products. Last year, Warren Buffett paid a price to buy Kraft Foods stock. However, today, the price at which the Kraft Foods stock is available is lower than the price that Buffett himself paid. So, it either means that the stock markets and various investors have stopped trusting Warren Buffett's investing instincts or else the price is abysmally low. These are oversold markets. The only problem with falling markets is that it demands a great deal of courage to go out and buy when everyone else is selling and the markets are falling every day. And then when any blue chip stock you see falls just about every day, you aren't sure about the stock you would like to go out and buy. However, times are these are great for famous investors. If you really want to make a pot of money, the proverbial pot of gold, this is the best time to go out and buy into blue chips slowly. There is no need to put all your money into stocks at one go because no one can really time the markets but it indeed a great time to invest gradually. Check out the YouTube Video and enjoy. Which stock are you going to buy in these bad times, if you happened to stay in the United States? Probably, nothing. But isn't that being foolish, being scared of the dips in the markets. Dips are good because they cleanse the system. The only problem, this time around, is that we don't know which sectors are well insulated. Automobiles are in the lurch and financial services, along with insurance and real estate, are to be avoided. That doesn't leave us much room. Pharma stocks are uncertain right now but they wouldn't be a bad bet in the long run. Today, I would like to speak about a company that has never failed to amaze me. I am sure all of you have heard about it. We are talking about the great Warren Buffett's company, Berkshire Hathaway and about its Class A stock, which is awfully expensive to buy. You can track the stock here at the AOL Finance website. The current market price is $120,400, so, if you had the money, you could make a purchase. The stock has taken a beating because of the broader market trends and I find it a pretty defensive stock in these market conditions. The only good news in the present stock market gloom is the fall in oil prices. Oil is selling a bit under $100 per barrel. It has really taken a hit from its highs of $140 odd per barrel. If we had a spike in oil price, even if it were a speculative one, or if we had any other oil related crisis the world over, it would send the financial markets in a real tailspin. There is real fear on Wall Street. And most companies believe that they might be the next after the fall of Lehmann Brothers. So, the United States government, along with its friends in the OPEC, should ensure stability, or even better a fall, in oil prices for the next week or two till the present crisis subsides. One also hopes that Wall Street does not come up with further gloomy news. There is a major fall in the stock markets. Wall Stress has been badly bruised. Another one of the venerable financial firms has collapsed. Lehman Brothers is no more and it had been there for the last 158 years. And add to this, another bit, Merrill Lynch has decided to sell itself to Bank of America. And AIG, American International Group, which offered Tata-AIG insurance in India, is trying to keep afloat. This wave of collapses some after an earlier wave, where we had Bear Stearns being sold off for a pittance. And Citi taking in a big write-down. We also had Fannie and Freddie in deep waters. The Indian markets are ruling about 4.5% down at the moment. Interestingly, there is nothing which is so serious with India that it should be fall. So, this is actually sentimental. Yes, when the US sneezes, the world catches a cough. It is undoubtedly shocking and very terrifying for anyone who is into the financial markets right now. But there isn't much room for real panic for the people in the Indian stock markets. In fact, I would suggest my NRI friends and other foreign nationals to seek avenues for investment in the Indian markets. There is good and real qualitative money to be made from the Indian markets at this juncture. The only important thing to keep in mind is to adopt an intelligent approach. For those of you, who haven't heard of the great Dhirubhai Ambani, you have heard nothing all your lives. He was one man who rose from middle class beginnings and became one of India's biggest industrialists. He singlehandedly created Reliance Industries, the great brand and the conglomorate that it is today. Dhirubhaism: Change your orbit, constantly! He would often explain that we are all born into an orbit. It is up to us to progress to the next. We could choose to live and die in the orbit that we are born in. But that would be a criminal waste of potential. When we push ourselves into the next orbit, we benefit not only ourselves but everyone connected with us. Take India's push for development. There was once a time our country's growth rate was just 4 per cent. Look at us today, galloping along at a healthy 7-8 per cent. This is no miracle. It is the product of a handful of determined orbit changers like Dhirubhai, all of whose efforts have benefited a larger sphere in their respective fields. However, when you change orbits, you will create friction. The good news is that your enemies from your previous orbit will never be able to reach you in your new one. By the time resentment builds up in your new orbit, you should move to the next level. And so on. Changing orbits is the key to our progress as a nation. I am really sorry, my dear folks, about my absence, or rather my silence. It has been few days but the truth of the matter is that I was exceptionally busy with a number of things, and so busy, that I didn't even have the time to complete my sleep well. I'm not exactly out of the woods yet but would surely be soon. This is really a very important milestone and it means a lot. There are a number of stock picking strategies. One of them is known as cherry picking. The idea of cherry picking is to buy those stocks which are available at rock bottom prices or which are going through bad times due to various reasons. Cherry picking is a sure short strategy but something that requires a lot of patience from the investor. It is quite possible for the investor to lose faith and exit quickly, which would either result in a loss or in minimal profits. So, how do you pick the cherries? If you were in the US, should you buy General Motors (GM)? I'm a member of Social Picks, the social networking site on stocks that Reuters runs. I am upbeat on General Motors but a number of other investors feel that it is an absolutely wrong and foolhardy choice. But wait a bit... GM is a pretty old company, which is going through really bad times. There are fears that the company could fold up. The stock price is really down. But does it mean that the company would file for bankruptcy protection? Not really. The company is going through what are known as classic recessionary conditions. Accumulating such a stock in small and regular quantities is not a very bad idea. It has its risks and it requires a high degree of patience on part of the investor. But it also has the potential of creating decent profits. The only risk with a company like GM is if it were to file for bankruptcy or were to be bundled out for a cheap price, like Bear Stearns. Unless that happens, any worse case scenarios aren't so bad. The company could recover from high oil prices and falling sales. The United States could recover from the recession. If GM performs very badly, it could be taken over by another foreign company, which might as well have a positive effect on stock price. So, if you think logically, cherry picking isn't such a bad idea. This seems just off the wires. I don't know how authentic this is or whether it is simply one of those rhetorical comments by a budding politician. I found a rather sensational piece of news on the Indian Express website, where it quoted Obama saying that 'Pakistan is preparing for a war with India'. You can read the news here. Now, believe me, I'm not bragging at all. I had bought shares of Apollo Tyres last month for Rs. 30 a share and today, after the fall in the markets, Apollo Tyres is still selling at Rs. 37 a share. So, we are essentially talking about a profit of Rs. 7 or 23% profit within a month. I don't think that's bad. I could have easily sold my stock. But I am trying to change my investing strategy these days. For a long time in life, I have tried my hand at various trading strategies, inluding day trading, BTST (Buy today-sell tomorrow), very short term trading (with a week's margin), short term and medium term investing (selling stocks at a profit within a time frame of two to six months). But now, I would like to try my hand at a very different investing strategy in life. There was a time in life, about ten years ago, when I used to follow this strategy. But those days, this strategy wasn't very well worked out in my mind. Now, it seems that it has been well worked out mentally. These days, I have begun investing in stocks the same way as one invests money in long term bank deposits. I am now following the classic long term investment strategy and I have this strong feeling that it is going to pay me pretty well. Isn't it nice when you find that your own evaluations of the stock markets are backed by well-known brokerages? On August 11, 2008, Anand Rathi, a well-known Indian brokerage recommended Development Credit Bank [DCB] at the current market price of Rs. 58 with a stop loss of Rs. 50 and a medium term target of Rs. 78. Earlier this year, I had bought the stock at Rs. 110 and sold it at Rs. 145 within a short span of three weeks. So, when it started falling and it reached a low of Rs. 45, I thought that was the right time to buy it. But when I was signalling a buy in my personal charts, there was no brokerage recommending it. But now when it began rising a bit, we have Anand Rathi recommending a buy. I find this really interesting. And fascinating. I am only hampered by big time finance, which is why I am still a small time player. With more finance or with investment finance from some of my friends, I could do a pretty good deal. I would not be able to beat the legendary Warren Buffett because he has been a genius and I have often found him pretty inspiring. But I would have done pretty well if I had started off with an investment partnership. And I would do pretty well even if I opened one right away! Yesterday, there was a major crash at Wall Street and it seems that the experts did not seem to know the reason behind it. As a result, there was a major sell-off in Asia and Asian indices fell heavily across the board. The Bombay Stock Exchange in India fell 415 points. Hong Kong's Hang Seng index fell and breached 20,000, which is the lowest in seventeen months. It seems as if the economists expect the United States to have lost another 70,000 jobs last month. There are still fears of recession in Europe. Interestingly, this fall in the Wall Street came yesterday even as oil prices fell. Usually, a fall in oil prices leads to a rise in stock prices. So, the movement in the markets yesterday was somewhat perplexing. It seems as if the markets are still trying to find their bottom and they don't seem to have stabilized anywhere at all, despite some rally in stocks that we saw in the eight weeks or so. Oil has certainly fallen from its peaks but the stocks would still need another booster dose to get fired up. This also means that any rise in oil prices could have a rather debilitating effect on the stock markets worldwide, especially with the depressed market sentiments. The difficult thing about blogging is that you should blog every day or few times a day even though the format of the blog allows you the freedom to be erratic. However, you should blog every day for a variety of reasons, which include your being a 'professional blogger' but they also include the fact that a blog is a constantly read document. It is a weblog, a web diary, but it is also something that people read and if you have few readers who would read your blog regularly, it would be so painful for them to log onto your site any given day and not find anything new. So, even if you don't have commercial reasons for blogging, you should blog for the sake of those who would like to read what you write. Why shouldn't I also write about it on my blog? So, in the last two weeks, we have moved up 400,000 in Alexa rankings for our blog. I know it would be tough to grow at the same pace in the coming days but I am sure your support and repeat visits would certainly help. I am sorry for being lax for the last four days. I had promised myself that I would have one hundred posts in August but I missed it by a whisker. But that doesn't mater. I understand that you might have found my silences deafening. I am sorry about it but I was too fatigued to write anything here. There was a lot of physical fatigue that caught up with me and I was too busy with some other projects. I would like to inform my students that I am collecting a number of online resources dealing with English phonetics. I would be uploading the list pretty soon. I am sure you would find it really useful. I have found some links for my students. These links should be helpful for students pursuing a course in public relations. I wouldn't state that these materials are exhaustive in any way. But they should help the students get a good, firm grasp of what public relations entails in addition to their lectures. Have you ever thought about hosting your own website? Or do you always go in for free providers and host your websites there? Or you just don't have your own website? I know of a number of people who don't even have their won websites. I thought I was always net savvy and I find it tough to believe that people won't have their own websites, especially those people who are kind of well-known people. I learned about a website that I wished I had found out earlier because I would have gained a lot from it myself. This website is called webhosting rating. It is a website that rates some hosting providers. There are so many web hosting providers out there on the Internet that it becomes tough for an individual to make an informed decision. And there are sufficient possibilities of the person being taken for a ride. So, Web Hosting Rating is a great website because it reviews hosting providers. If people are going to get themselves a new web hosting account, it would be really beneficial to go to this website and find out about the various hosting providers. They have some very interesting articles there. You can read one on Payment Options for Your E-Commerce Site. There have been so many things going on in my life that I sometimes feel at a loss to describe everything. But I still feel that I could do a lot more. The more I work harder and the more activities, I find myself involved in, the more I have this feeling that I'm not doing anything at all. Why do I have this feeling? It isn't a feeling of dissatisfaction... in fact, I'm really satisfied in life but I still have this great burning fire in my belly. I found about a website that reviews fenphedra, which is a diet pill. The website states that when the reviewer first heard of Fenphedra, it was kept like a hidden secret. Then later on, it was learnt that this medicine was quite effective. The website tells us that that Fenphedra is a CART activator. A CART activator is defined as a chemical in the brain that tells the body that the stomach is full, even when it isn't full. So, if one feels very hungry and if one takes this pill, the person would lose the appetite. The website states that the pill is made up of a buffered caffeine salt that is gentle on the stomach. The website also states that the medicine has Phenylethylamine, which is defined as an ingredient that creates a good feeling in the person who takes it. But one certainly needs to check on the claims independently and if the website's assessments are correct, one should certainly believe them. In the first place, you might be tempted to ask me, "What is extreme acai berry?" And that itself would have me explain the term 'acai berry'. Acai berry is a traditional palm fruit and it is believed to be quite beneficial. So, we have this website that reviews a drug, a diet pill, which claims to offer the benefits of the acai berry and states that the drug offers great health benefits. This website in question seeks to debunk the claim. The arguments used here are quite convincing. They are against a diet pill called 'extreme acai berry', which has a website and which claims they would offer a '14 day trial' and then they would auto-bill and auto-ship the customer. It is an interesting site because it reviews health products sold online and seeks to alert customers about the various scams that are floating around. I found it quite interesting to read. Isn't 'Driver Side' a strange name for a website? Nope. It isn't because it deals with automobiles. It is a site that tells you about the car that you drive. It makes it easy for you to buy, own and sell a car. The website states that it provides tools which would help in this objective. The website has very interesting features. As a website focused on automobiles, I found it very impressive. The site has a drop-down menu, where one can choose the year of the car from 1945 to 2009, the make of the car, which includes a number of brands from Aston Martin to Mazda and Ford to Ferrari. One can also choose the model concerned. The website is fascinating in a number of ways. In terms of utility, it is quite helpful because it would give you an opportunity to find out about the car that you drive, its year, make and model. On yet another level, for the car enthusiast, the car buff, one can always improve one's knowledge about the various car models that are covered on the website. And the list is quite comprehensive. The most interesting thing here is that in the last six days, we have increased our traffic by 250,000. :):) Not bad. The credit goes to you. Please keep on visiting and please give me more success. One of my former students who's pretty qualified and is certainly a post graduate and has an excellent CV emailed me a week ago. S/he came to my house and we discussed his/her future career plans. So, s/he's going to study further, which is fine. The interesting bit was when s/he emailed me and asked me if s/he could also teach as a guest faculty at few places, where s/he has seen other students teach. And s/he knows, and I know too, that those other students who are teaching at various places weren't as competent or qualified as him/her. That's exactly why it took me a week or so to write this post. I didn't have the heart to email him/her right away. Let me explain in an off-tangential manner. In 2001, we had a new course at the University. It started at our Department and this was Certificate in Italian. We had this teacher from the Italian Cultural Centre, Carlo Buldrini, a very senior and an exceptionally competent person. I had been working since 1995 in various adjunct capacities and in 2001, I still didn't have full time tenure. When the course began, I had already been to Italy for the First ProZ.com Annual Conference, where I presented a paper on literary translation. And Carlo was also the former cultural counsellor. He was also the person who had co-authored the book that was used to teach Italian at the Italian Cultural Centre in New Delhi. So, I would discuss with Carlo, or rather crib a bit, about how one has to wait a long time to get full time tenure in India. I would often tell him that I had spent six years in an adjunct position. To which, Carlo said, "The situation is so much better here. In Italy, it is worse. You have to wait till you are forty or forty five to get full time tenure." I found his words pretty comforting. And then in 2002, I did get my full time tenure. Carlo also said that back home, he knew of students who would run after their supervisors...and give them a lot of importance to find a job. Now, I had never done that and who knows that might have been one of the reasons for the delay. But when I looked at what he told me, it did seem quite comforting to realize that I had been an adjunct faculty a mere six years. Coming back to my former student, I didn't have the heart to tell him/her that s/he probably would need to run around some 'senior' [read 'the people who mattered'] professors, if s/he really wanted to get an adjunct position. Another alternative [if like me, s/he doesn't like running after people and has a strong sense of self-esteem] is to put in 'cold CVs'. But as every marketer should know, 'cold CVs' always have a lower chance of being successful. And they take a long time to bear fruit. And then in most hierarchical and feudal systems which are prevalent at so many places in India, it would be foolhardy to think in terms of 'cold CVs'. I would suggest that my former student should use both approaches--the running around one as also the 'cold CV' one. If s/he wants, I am always there for expert advice and I am also there to form career strategies for my students. I guess this would certainly interest those kindred souls like me, who are into a number of things, such as translating life sciences materials. Consumer Price Watch is a website that states it is a 'source of unbiased diet pill reviews for consumers'. I have taught PR (Public Relations) to know that any claim should always be analyzed and not taken at face value. Here, they speak about Phentermine Review. Now, most of you might be at a loss about Phentermine itself! And you can't be blamed for being so. Most people that we know, who do not belong to the medical profession or aren't part of the medical support staff, are really unaware of the medicines floating around in the markets or what their compositions might be. This seems strange because these prescribed medicines that we take from reputed doctors affect us. They don't affect the doctor. The website states that Phentermine causes 10-15% more weight loss compared to a placebo in a double-blind study. So, what is a placebo? It is a harmless substance. And what is a double-blind study? It is a randomized study where two groups of people are administered the drug and both the doctor and the patient are unaware of who is being administered the study drug and who is being administered the placebo. This is to ensure fairness in the results and to eliminate any element of personal or psychological bias. You might like to read a very interesting article called The Evil of Religion. I found it a pretty interesting and a logical article. Congrats to Ajit Dongre. I wouldn't say as much but with Biden, Obama has chosen an 'experienced, respected' Democrat. Is this his strategy to counter McCain's 'experience'? If it is so, then what about the message for change? Interesting questions. Many answers. Some tough ones too. My target is to break into 1,000,000 soon. But I could do it only if you folks keep on visiting in large numbers and support me as you have done till now. Attempt a profile of Usain Bolt. The profile should be succinct and should include an analysis of the negative observations on his antics on the field. The write-up should strive to create a comprehensive profile of the sprinter. 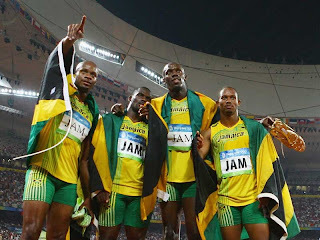 Bolt is the tallest in the picture above. He is third from left. If you don't write on Usain Bolt, you write on nobody else. Only four people: Usain Bolt, Carl Lewis, Bobby Morrow and Jesse Owens have won the 100, 200 and 400-meter relay at the Olympics. In terms of greatness, I would place him at par with Jesse Owens right now. Later, as we get to see Bolt, one might rate him higher. He has broken records which have been pretty old. I have such anecdotes to narrate about the perceptions of most people about the stock markets and about investing that it would probably make you die laughing. People have such outlandish and strange ideas when it comes to investing that one could find it really difficult to believe. I had a good friend. I still know him. We used to stay nearby and meet everyday. So, one day, about ten years ago, he met me and said, "I have made some money working for a company and I have some extra cash to spare. I would like to discuss investment options with you." I told him, "That's great. But before you begin investing, the first thing we should discuss would be the returns that you would expect on your investments." Those days, the banks gave a maximum of 10% per annum on term deposits. He had made some money as a freelancer and he wasn't eligible for the Employees Provident Fund, which would have given him a return of 12% tax free. Anyway, he wasn't in the tax bracket but if he were, the maximum tax bracket was 30%, so, the maximum taxable return, he could have got would have been around 17% in a year. So, when I asked him, what he expected from the stock markets to do for him, pat came his reply. He said, "I would like to double my money in a fortnight but I could wait for a month." I was furious and as he was a good friend, he didn't mind my outburst. I told him, "You jolly well get into a casino!" Most people have such strange notions about investing money in the stock markets. If the best return that he could have got in the country from safer avenues was 17%, he should have been content with around 25% from the markets. If he set his objectives at 25%, he wouldn't ever lose his money and would invest scientifically and his investments would be strong fundamentally. The site also offers free alerts when new items are available for purchase at different stores for this occasion. There are a number of items that you can buy here. They have a wide variety of items. For instance, you can buy office supplies from Office Max or you can buy books and other stuff from Amazon. For instance, when you go to the Office Max page, you would be amazed to find out about the number of items that they have on sale. These include Kodak cameras, Sandisk USB drives, HP and Brother printers, Kaspersky Internet Security, Logitech Mouse and Keyboard combo, routers, adapters, headsets, projectors, furniture and toners among other items. This is a pretty interesting idea and I am really happy that the site owners took trouble of making a site that helps people with their holiday plans. Isn't it really great and thoughtful? The noted English critic F. R. Leavis called Hard Times as a minor classic. He was one of those rare critics who praised the novel. Most critics had criticized the novel. But one should also keep in mind the fact that Charles Dickens was a novelist steeped in the social realist tradition and his novels display a clear sense of social realism. Hard Times is, in fact, a novel that belongs to a sub-genre of the Victorial novel called the 'social problem novel'--a novel that specifically focussed on social problems of the day. The social problem being discussed in this novel is the problem of the present educational system in England and the follies inbuilt into it.